Global West Suspension manufactures performance Del-A-Lum upper control arm bushings for the Chevelle, El Camino, Malibu, Monte Carlo--model years 1964, 1965, 1966, 1967, 1968, 1969, 1970, 1971, and 1972. Del-a-lum bushings replace the original bushings in stock A frames. They are used for street, road race, drag race, and pro touring applications. They will not squeak! Del-A-Lum bushings are a direct replacement for rubber or polyurethane control arm bushings. They are perfect for street or race applications. Del-A-Lum bushings feature inner and outer thrust washers, inner rotating sleeve and lube fittings. In order to use this kit with your stock upper arm and cross shaft. You need to check the cross shaft and make sure it is the style that has a large diameter 5/8 nut holding the bushing in place at the end of the shaft. If you have a 3/8 inch bolt holding the bushing instead, you will have to upgrade the cross shafts to Global West Part # 702 shaft. Global West Suspension manufactures performance Del-A-Lum upper control arm bushings for the Chevelle, El Camino, Malibu, Monte Carlo--model years 1964, 1965, 1966, 1967, 1968, 1969, 1970, 1971, and 1972. Del-a-lum bushings replace the original bushings in stock A frames. They are used for street, road race, drag race, and pro touring applications. They will not squeak! Del-A-Lum bushings are a direct replacement for rubber or polyurethane control arm bushings. They are perfect for street or race applications. 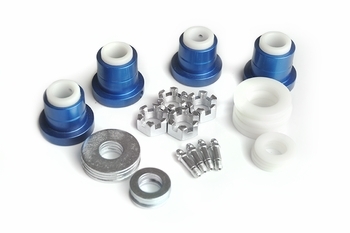 Del-A-Lum bushings feature inner and outer thrust washers, inner rotating sleeve and lube fittings. In order to use this kit with your stock upper arm and cross shaft. You need to check the cross shaft and make sure it is the style that has a large diameter 5/8 nut holding the bushing in place at the end of the shaft. If you have a 3/8 inch bolt holding the bushing instead, you will have to upgrade the cross shafts to Global West Part # 702 shaft.